2D rendering is fun stuff. If we’re being honest, we can admit that it’s the same thing as coloring, though we spend a little less time trying to stay inside the lines. When it comes to tools, we left Crayolas in the dust long ago, too. If you’re looking for flexible, attractive, yet inexpensive presentation materials, 2D may be the way to go. What could you use 2D renderings for? Site Plans – A rendered site plan is ideal for showing the relationships between spaces on the site. Built areas, green areas, impervious surfaces compared to drainage areas, parking, tree counts, and site access are all more clearly defined in color than on a typical CAD site plan. Colored Elevations – 2D Rendering was made for colored elevations. Our clients love to see their buildings not just in color, but with the exact materials that they’d like to use. With graphic software, we can even change out individual materials with ease to experiment with multiple color schemes. Often, as with site plans, building departments require colored elevations to compare the ratios of certain required elements on a facade to others. For example, Charleston County, SC requires colored elevations of commercial projects to ensure that each building is finished in as much as 75% brick, and in colors that comply with strict guidelines for development. Finish Plans – What’s a finish plan if it doesn’t show actual finishes? 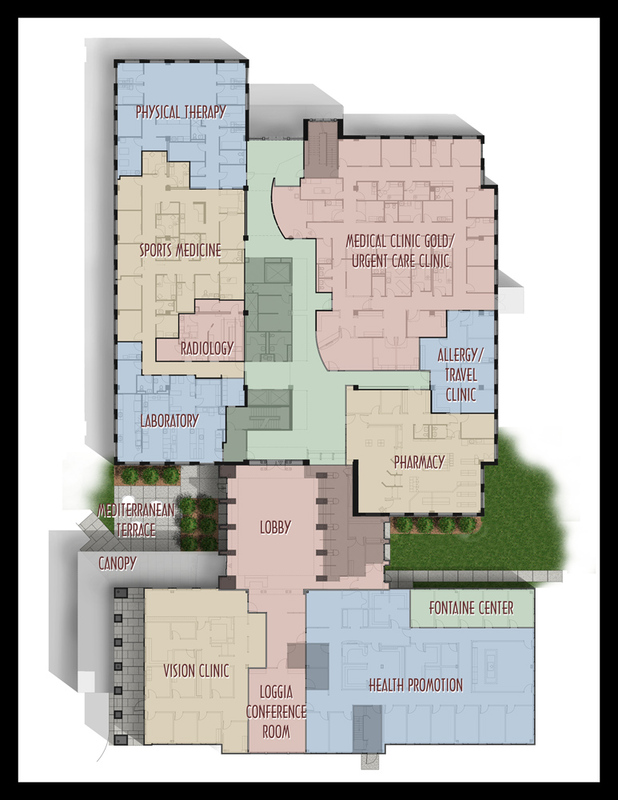 One of the more interesting ways we use 2D rendering is to show interior finishes of the spaces in a floor plan. It’s not uncommon to render an entire floor plan, leaving spaces on the sheet for the application of actual samples of the materials represented in the image. It’s a hands-on way to show your clients what you have in mind for their finishes while giving them a good idea of what their finished space will look like, as well. The medium is far from limited to these examples. If you have an idea you’d like to see colored up, let us know. We’re happy to help and, as always, quotes are free. Visit our 2D rendering gallery for examples of how we put 2D graphics to good use.